Directions: West on Avenida de Mesilla to Roberts Dr.; left (south) on Roberts to Grover Dr.; right on Grover Dr. The suggested donation is $30.00 and an RSVP is appreciated by calling: Maury Castro, ph. 575-541-6099 or 575-571-1923 (cell) or email maurycastro33@yahoo.com. Photos by Stephen Jones, from Otero County Democrats Labor Day Breakfast. 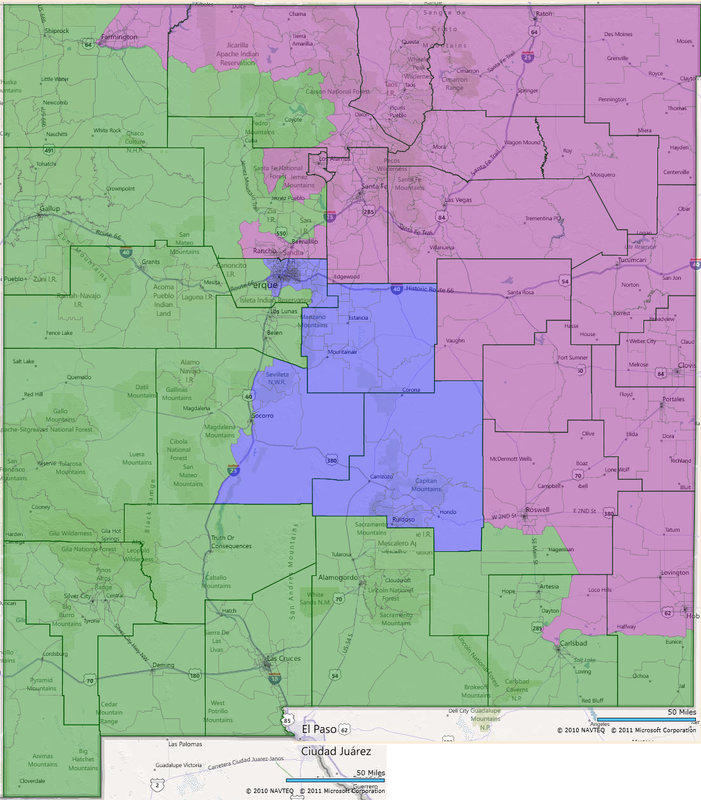 This is the second of a series of guest posts on redistricting issues by Sterling Fluharty, who lives in Albuquerque and is the owner of Southwest Political Services, which specializes in campaigns, polling, redistricting, lobbying, coalition building and publishing. Redistricting gives us the chance to put all three of New Mexico's Congressional seats in play for Democrats. But you wouldn't know this was possible if you had attended any of the New Mexico Redistricting Committee meetings this summer. At each meeting has presented its seven proposed congressional maps. The focus has always been on the geographical shifts that would happen with these maps. With the release about a week ago of political performance measures for these maps, it is now apparent that every proposal keeps the southern district safe for Republicans. New Mexico Democrats deserve to take back this congressional seat and need legislative leaders who will pursue this idea. New Mexico weathered the 2010 elections better than any other comparable state. Consider what happened in the last few election cycles. Indiana, North Carolina, Virginia, Ohio, Florida, Iowa, Nevada, New Mexico, and Colorado all voted for Bush in 2004. These are the same states that Obama flipped in 2008. If you add up all of the votes that Republicans and Democrats received in these states during the 2010 U.S. House of Representatives elections, you will find the GOP won the overall House vote in all of these states except for New Mexico. The Democratic share of votes for Congressional Representatives in New Mexico has increased fairly steadily over the last two decades. In 1990 New Mexico's Democratic candidates for Congress received only 41 percent of the overall vote. By 1996 the Democratic share of our state's congressional vote had increased to 51 percent. When Tom Udall ran unopposed in 2002, this statewide figure soared to 59 percent. Between 2006 and 2008, when each candidate had an opponent in the general election, the proportion of congressional votes (for candidates from major parties) that went to Democrats climbed again from 56 to 59 percent. Not a single Democrat in New Mexico running for Congress in 2008 received less than 56 percent of the vote. Between 2008 and 2010 every single one of New Mexico's representatives in Congress was a Democrat. Some people might tell you that the Obama phenomenon was what gave us an all-Democrat delegation in Congress. But the truth is that our state was already becoming more blue before New Mexicans ever voted for Obama. It was no coincidence that New Mexico started awarding more congressional votes to Democrats than to Republicans shortly after becoming a majority-minority state. In 1990 . Census 2020 will find that Non-Hispanic Whites make up a mere third of the state's population. If New Mexico continues to become blue at the same rate of the past two decades, I estimate the Democratic share of congressional votes in our state will be 66 percent in 2015 and 74 percent in 2020. In a few years from now, if we adopt one of the current congressional proposals, Democrats will realize it was a mistake to keep a congressional seat safe for a Republican. Research and Polling estimates in its proposals that a Democrat in the northern congressional district will receive between 57 and 59 percent of the vote. Since Research and Polling's statewide political performance numbers underestimate Democratic performance by a , they are actually proposing maps that pack Democrats into the northern district and will initially award at least 60 percent of the vote to Democrats running for Congress. We do not need to waste Democratic votes like that, especially when these extra votes could be used to elect Democrats to Congress in other parts of the state. With Dave's Redistricting App, it was relatively easy for me to draft a map of three congressional districts where Democrats could win in New Mexico. In terms of geography, one northern and eastern district would stretch from Farmington to Hobbs, another central district would occupy the space between Albuquerque and Ruidoso, and a third district would traverse western and southern New Mexico from Shiprock to Carlsbad. I have been advocating for this kind of map, both online and in , for over a month. The website I used to draw this map includes political performance data that demonstrates each of these proposed districts would be favorable to Democrats. If you try out this feature, take note that it uses the average of New Mexico's 2010 statewide election results, which means its political performance measures are based on a year that wasn't best for Democrats. My post next week, on legislative redistricting, will analyze political performance measures more critically and in more detail. With the $1.5 million our legislature appropriated for redistricting, you would think someone—within the company they hired, the committee they formed, or even legislative leadership—would have realized the need to draft and distribute the kind of map described above. As I have explained, New Mexico keeps becoming more blue and Democratic votes will not be spread too thin between congressional districts if they follow the above concept map. We need you to contact our Democratic legislative leadership within the next week and ask them to instruct Research and Polling to draft a map that will accomplish the goals set out in this blog post. Make sure you tell them that we want this new congressional map presented to the public when their Redistricting Committee comes to Albuquerque and Rio Rancho in the afternoon and evening of August 15th and 16th. Please RSVP on Facebook to join me and our New Mexico State Democratic Party Chair Javier Gonzales the Saturday before, on August 13th from 10:30am to 12:30pm at Kosmos Coffee House, in a discussion of our Democratic strategy for state redistricting and how we can prepare for the 2012 elections. And get ready to hold our legislators accountable with citizen lobbying during the special session for redistricting in September. This is the second in a series of guest blogs on redistricting by Sterling Fluharty. Click to see his first post.